My name is Ashlee, I am a work at home mama to 6 little ones and I love to create. My shop, Tweet Baby Designs, allows me to share my love of fabric and felt with the Etsy world. I make amber teething necklaces, wood and fabric chomping necklaces for teething babies, and accessories of all kinds. Now go create something beautiful and teach your kids to do the same! This giveaway is for $30 shop credit to Tweet Baby Designs. To enter this giveaway leave your favorite Fall drink in the comments below. Winner will be chosen on Monday. I love love love the teething necklace. Only a mom could come up with that. Favorite fall drink, has to be hazelnut hot chocolate from Starbucks. Love it. cinnamon dolce latte, half sweet.... the size depends on the kind of day I'm having! I really loved caramel apple cider in the fall! My favorite fall drink would have to be either pumpkin spice latte or hot apple cider! So delicious! A chai tea latte...oh with whip cream, of course! Vanilla Chai Lattes, made at home! The new Toffee Mocha at Starbucks :) It's amazingly wonderful and so fall like! Hazelnut hot chocolate for me! I could drink it everyday! Those amber teething necklaces are a must! Pumpkin spice lattes are my favourite fall beverage. I wait all year for them! Hot coffee is a must!! That's easy. Pumpkin spice lattes! Yerba Mate! It's this delicious Southern-American tea, and it just makes my whole body happy. My favorite is kind of simple, but so deliscious! I love mint hot chocolate. homemade cider for me, too! I love the fabric roses! Carmel Apple Cider has been my staple drink as of late. : ) I love this giveaway! pumpkin spice lattes or pumpkin coffee and carmel apple cider, yummm! Pumpkin spice iced coffee! Yum Yum!! Apple cider is the best - I always look forward to it! AWWWWWW! I love these! My brother and his wife are expecting twins late october/early november. I'm sure I could find something great from Tweet Baby! And my favorite fall drink is the pumpkin spice latte. MMMMMMMM delicious! My favorite fall drink is carmel apple cider! My favorite fall drink is hot apple cider, although I do love the pumpkin spice just as much. definitely a dirty chai...and oooh, what a lovely teething necklace. such a great idea. typically i love a spiced caramel latte (yummmm), but since i'm nursing i'm going to be sipping warm, spicy apple cider this year. loving the teething necklaces, we'll be needing one soon! I can't motherhood without amber teething necklaces. As for a fall drink: I love homemade hot chocolate--plenty chocolatey and not too sweet. pumpkin spice lattes for fall! My favorite fall drink is warmed apple cider with whipped cream on top. There's no caffeine, only lots of sugar and warmth. It's cliché but there's nothing better than hot chocolate. Yummieee! Pumpkin Spice Lattes from Starbucks. So tasty! Fave fall drink has to be, of course, a pumpkin spice latte. What can I say? Starbucks got it right!! I love fresh apple cider from our local orchard! My favorite drink is hot apple cider from our local farm. Yum! Pumpkin white mocha or hot cider! I love a Caramel Apple Spice from Starbucks, with extra Whip and caramel sauce! tall iced pumpkin spice latte with soy! no whip! soo delicious. hot chocolate! with lots and lots of marshmallows! caramel latte or hot apple cider. yum. mmm..i had some hot mulled cider today...my fave! Spiced Caramel Apple from Starbucks is the BEST drink ever!! Lively stuff, Ashlee! 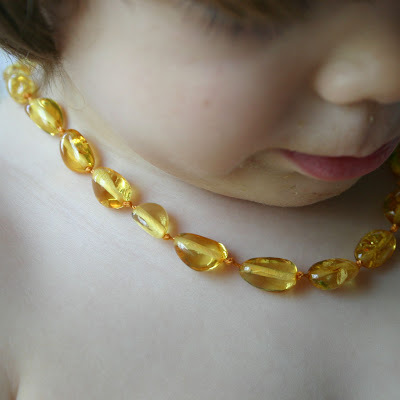 My friend's daughter is teething right now & these amber teething necklaces seem like a great idea - cute, too! My favorite autumn bev is a nonfat dirty chai latte with a shot of pumpkin or cinammon. They're equally delicious! The espresso keeps me awake & the taste keeps me happy. Love it. My favorite fall drink is hot chocolate! I have a new favorite fall drink -- a cider slushie! Delicious! i love me some caramel apple cider. and i would also love to score an amber teething necklace! I'm working on bringing my love of craft to my little one (she's only 11mos)!! My favorite fall drink is hot apple cider with a cinnamon stick in it - yum!! tea, nothing is better than a hot cup of white tea. thanks for the giveaway! Hot chocolate...as soon as there's a tiny chill in the air! Pumpkin Spice Latte! Hands down. and i think my child needs that teething necklace. my favorite fall drink is hot chocolate! yum! homemade apple soda :) yummy. pumpkin spice latte from starbucks (hands down)!my friends & i get at least one week. I am torn between a hot Chai Tea Latte and a Sea Salt Hot Chocolate. Yum! My favorite fall drink is a simple chai latte. I purposefully do not drink until the fall season and it gives me something to look forward to when the weather gets chilly. When the fall starts (I mean real fall with rain and wind) I really miss summer. And therefore my fave drink is hot tea with some summer berries or fruits, which took in all the warmth and energy during the summer and gave it all back away in a cup of tea. Luv it. fav fall drink? oooh I think that may be hot apple cider! hot chocolate with halloween marshmallows! forgot to write coffee with cinnamon and nutmeg. so warm and delish. like fall in a cup. Tough choice. Probably hot apple cider. A teething necklace is needed in this household!! I love hot apple cider in the fall. Although I do also love the pumpkin spice latte and hot chai tea lattes. Yum! I am a HUGE tea drinker so when the weather turns cold, my tea gets warm! I ALWAYS choose teas that remind me of the seanson and my local gs carries a pumpkin tea that is so YUM! mmm, chai ...... or hazelnut coffee!!! gotta go with the pumpkin spice lattes or gingerbread lattes. love the teething ideas. so cute! Pumpkin spice cappuccino, mixed with hot chocolate and an extra dash of cinnamon and sugar! Homemade mulled apple cider is excellent as well, but for me, it's a rare treat...Pumpkin spice is a weekly must! A cup of hot coffee with a shot of coffee flavored lacquer in it. hot, hot apple cider in a tea cup from my great grandmother's collection. Hands down, a pumpkin spice soy latte from starbucks. I look forward to fall because of starbucks! Previously I would have said pumpkin spice lattes, but I have recently discovered the deliciousness of Salted Caramel Hot Chocolates!! Delicious! Who can resist the pumpkin spice latte? Definitely not me! pumpkin spice lattes are the best! Mexican hot chocolate! Nothing like a drink that makes me think of being a kid again! Love the teething necklaces! My favorite fall drink is apple cider. mulled cider - cider that's been left to simmer all day with apples and cloves ... it warms you through. That would have to be coffee! Made from scratch hot cocoa with marshmallows...in fact...I am going to go make me a cup right now! White hot chocolate, for sure! Pumpkin Spice Latte from Starbucks for sure! My favorite fall drink is apple cider. This time of year I can start to find some locally made stff. If I were to live further from Southern CA, I'd go with hot chocolate. Because it's awesome. Always. Favorite fall drink is hand's down white peppermint mocha. I know this is more of a winter drink but as soon as the weather changes they are back on the menu and ready for my drinking! Ooooh it's spring here so I have to switch my train of thought! Oh, it would have to be a spicy, peppery, soy chai...with a dash of honey! Mmmmm. mmmm. the ever favorite pumpkin spice latte! i had to figure out how to make them at home, so i wouldn't give starbucks all my money! I love mulled apple cider! Pumpkin Spice Lattes hands down. Love, love! I loveeeeee just plain old hot chocolate!! YUM!! favorite fall drink is a cinnamon mocha...and if I"m feeling frothy...to add the cinnamon flavor...I use Goldschläger! OOh I hope I'm not too late, I love her shop! My fav falldrink it hazelnut creamed hot chocolate from qt.....soooo yummy! Favorite fall drink?? Peppermint Mocha! Wait, is that too Holidayish? Well, I guess I like to start the festivities early! Thanks for sponsoring such a great giveaway! My favorite drink in the fall is a pumpkin smoothie. Kind of cold for the fall but that is when you can find them.